Game of Thrones, The HBO series, is again nominated in two categories for Ace Eddie Awards 2016, with two episodes of season 5. The fans remember the epic episode 8 entitled Hardhome where Jon Snow and his team face the White Walkers. This one is nominated along with episode 9, Dance of the Dragons in the category "Best Edited One-Hour Series for Non-Commercial Television". Game of Thrones will compete with Homeland, The Knick and House of Cards. The event will be held on January 29, 2016 in Beverly Hills. The HBO series will also be nominated for a Golden Globe in the category of "Outstanding Drama Series" of 2015. The Shooting for the Game of Thrones Season 6 has just been completed and will have the particularity proceed of George RR Martin’s novel, Winds of Winter, which will be released later. In an interview with Den of Geek, Natalie Dormer reveals more information about her character Margaery Tyrell and says the new features of the next season. "We have more books on which we rely. This will be the first season fully independent producers David Benioff and Dan Weiss, without the support of George RR Martin. It'll be very interesting to see for the fans, we enter somewhat uncharted territory. "Tell Natalie Dormer. 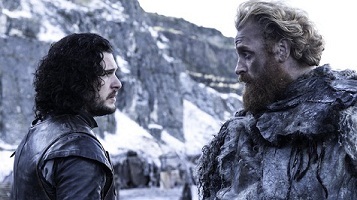 The return of Jon Snow will be the focus of the plot. It is still unclear under what circumstances the Lord Commander will be brought back to earth. Fans of Game of Thrones will have to wait until April 2016 to find out the beginning of season 6 on HBO.